For the past two months I have been using the Redragon Impact MMO Gaming mouse exclusively so that I could tell readers exactly how it feels using a 12 thumb button mouse that has customizable weights and custom macro and DPI options. I can say this mouse passed with flying colors in all but one area and I will cover the one unusual issue later on at the end since most users will never see the issue I had as it requires a unique setup. When the mouse arrived I found all of the weights were already pre-loaded in the mouse and the separate container for the weights was empty, not sure if they all arrive like this, but even with all the weights added the mouse was lighter than other weighted mice that I have used. I normally don’t like mice that are too light as when I click the button it can cause drag or slight movements that are picked up by the mouse just from pressing the buttons if the mouse isn’t heavy enough and is too sensitive. Overall tweaking the sensitivity, poll rate and DPI helped alleviate that the mouse as a tad light but it was by no means the lightest mouse I have ever used. I have used mice before that felt so hollow and like cheap plastic and this mouse did not feel that way. 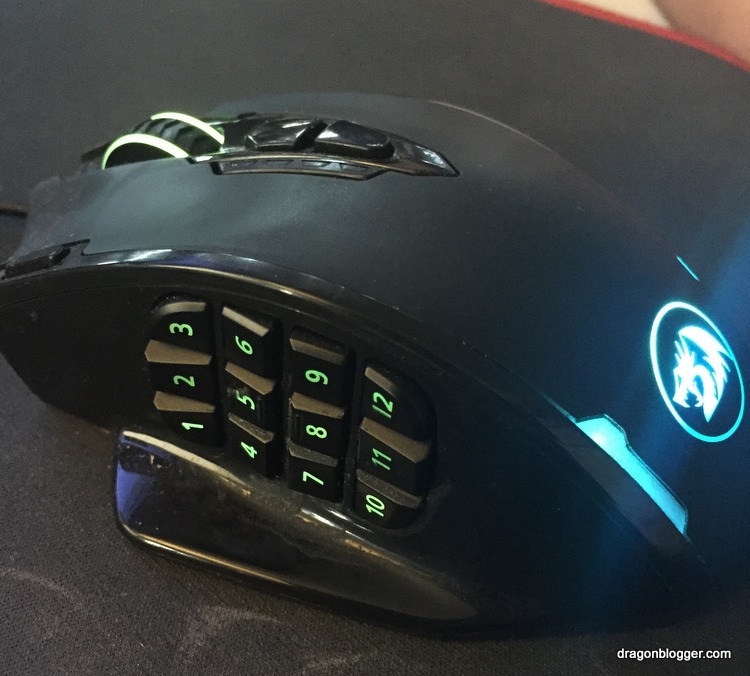 The 12 thumb buttons are pretty typical on an MMO Gaming mouse and Redragon is not the first brand to offer a mouse with 12 thumb buttons, a LMB, RMB, index finger button and 2 DPI buttons under the scroll wheel/button. All in all you get a mouse with a total of 18 programmable buttons and you literally can replace the function of every button if you want. It has color options for the logo and light exposed area’s near the logo and various patterns for the LED light as well. 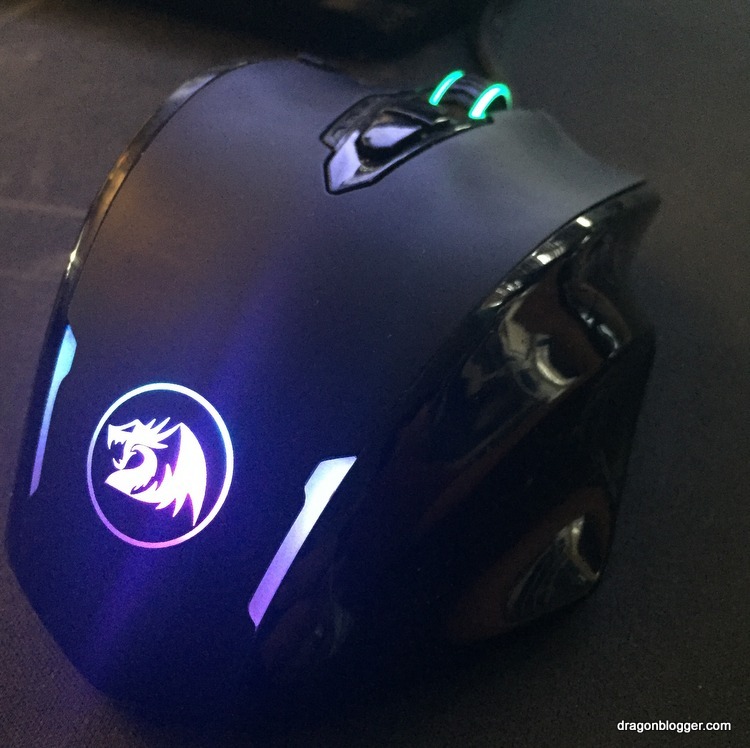 To customize the Redragon Impact MMO Gaming mouse you need to download and install the Redragon Impact Mouse software which you can get from the Redragon Downloads page. The software comes packed in a .rar file format so you need an unzip utility like 7-Zip which is free to extract it. I had a reader not know how to extract rar files and say the file download was broken but the files are fine. This mouse stored up to 5 profiles so you can access the button customization settings for the specific game you want to play. Creating macro’s is simple and this was the only mouse I reviewed that was a 12 button MMO style where the macro button could be configured to infinitely loop while button was pressed which was something that wasn’t an option in my previous MMO gaming mouse. The wide wing tips on the sides of the mouse let my thumb and pinky rest on the mouse itself and not drag on the mouse mat which was a plus in my opinion, as I hate when my fingers touch the mouse mat and drag on it when using a mouse. Overall I found the mouse to be excellent in both size, shape and design. 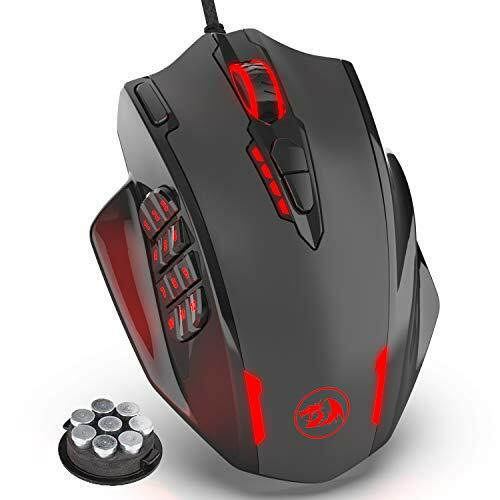 For the price of $32.99 on Amazon really even if you didn’t use 12 thumb buttons the mouse is among my favorite gaming mice and can accomplish just about anything with the right DPI and Polling combo. Other than it being a wired mouse and having a braided cable which was nothing special, as some of the plastic coated braided cables are more resistant to crimping and tangling, the mouse is probably my favorite wired mouse to date. One particular issue that I had with this mouse that I didn’t with other mice is that randomly when using a USB KVM (Keyboard, Video, Mouse) switch when working back and forth with 2 computers the mouse would have random issues. By this I mean the mouse would not work, and lose it’s button presets, the scroll wheel would stop working, sometimes no buttons on the mouse would work. Sometimes hitting and switching the KVM switch back and forth again would force it back to recognition and working, but other times it would permanently lose it’s button configuration requiring me to use the software to re-program and reset it. I was able to reproduce this issue on the 1st Impact Gaming mouse they sent me and the 2nd replacement they sent me to see if it happened with both. However, the unusual thing is only 1 of my Windows 10 64 bit systems this happens with, it never happens when switching to my other Windows 10 system, so it may not be the mouse specifically but something to do with that Windows computer except my older MMO Gaming mice it never happened. It happens about 1 out of every 10-12 USB switches, and it is an anomaly I cannot figure out but again if you aren’t using a USB switch and forcing the mouse to switch back an forth between computers you likely would never even come across this anomaly.